I am very excited to be running the 2019 Boston Marathon, which will be my first marathon. 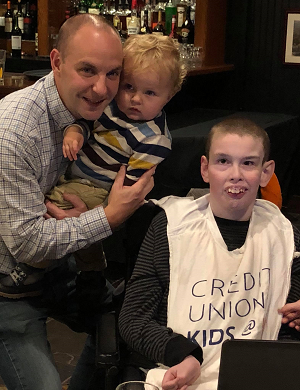 I am extremely honored to be running on behalf of my patient partner, Everett, and his family as a part of the Credit Unions Kids at Heart Team. Everett has Menkes Disease, which limits his mobility and his ability to speak. Despite this, Everett goes to school every day, loves watching movies and has a great sense of humor. Everett and his family have been going to Boston Children’s Hospital for the past 14 years. Presently, he and his family travel to Children’s Hospital 4-7 times a month to visit all the different specialists that help ensure that Everett can live comfortably. While running the Boston Marathon will be extremely challenging, it will never compare to the challenges that Everett and his family face on a daily basis. 100% of the funds raised by Credit Unions Kids at Heart go directly to this very important research. On behalf of Everett and all of the children who receive care at Boston Children’s Hospital, thank you for making a difference.